Turkish PM Erdogan: No restoring relations with Israel unless it apologizes over Marmara incident. Turkish Prime Minister Recep Tayyip Erdogan reiterated on Sunday Ankara’s conditions to improving relations with Israel. “We will never reconsider restoring our relations with Israel,” until Israel lifts its Gaza blockade, apologizes to Turkey and pays compensation for the nine Turkish nationals killed on a Gaza-bound vessel by Israeli commandos in May 2010, Erdogan said, according to the Turkish daily Hurriyet. The remarks were made during Erdogan’s address to his ruling Justice and Democracy Party (AKP) congress in Ankara. The prime minister also said Turkey will continue to give support to “the Palestinian cause” in order to make them live in peace. “I call on China and Russia: Please, reconsider your stance. History will not forgive those who side with this cruel regime,” Erdogan said, according to Hurriyet. Sunday’s remarks basically repeated Erdogan’s refusal ten days ago to heal his breach with the State of Israel. However, the tone of those remarks seemed softer than in the past. The Marmara incident involved nine armed terror activists who attacked Israeli commandos in a clash aboard the Mavi Marmara flotilla ship. The vessel, owned by the Turkish IHH group, was one of six sent to illegally breach Israel's maritime blockade of Gaza as a “humanitarian flotilla” but was found to be carrying nothing. When the vessels ignored repeated Israeli navy requests to redirect their boats to Ashdod port, IDF commandos boarded each vessel to force them to port, where the humanitarian aid they were allegedly carrying could be off-loaded and carried to Gaza through the land crossings with Israel. In the case of the Mavi Marmara, however, the Israeli soldiers – armed only with pistols and paint-ball training guns -- were brutally attacked by the “activists” as they boarded, with several critically injured. The commandos who followed them shot and killed their attackers, leaving nine dead. “In a region where instability reigns, Israel and Turkey are two quite stable countries. I believe in [our] common interest,” Netanyahu told a group of Turkish journalists, adding that Turks and Jews have a long history. Foreign Minister Avigdor Lieberman has emphasized them Israel is ready to solve any outstanding disputes with Turkey, but it will not apologize to Ankara for the raid on the Mavi Marmara. “[The Mavi Marmara mission] was a clear provocation and it was our right to protect the lives of our soldiers. Frankly speaking, Israel has no reason to apologize,” he added. Meanwhile on Sunday, Erdogan announced that dozens of ministers from Turkey and Egypt will gather in Cairo in November in a bid to boost their alliance. "Accompanied by 13 ministers, I will be in Cairo in early November," for the meeting of a high-level strategic council established between the two countries to bolster ties, AFP quoted Erdogan as having told a news conference with Egyptian President Mohammed Morsi in Ankara. "I am fully confident that the meeting ... will bring about very important results," said Erdogan. 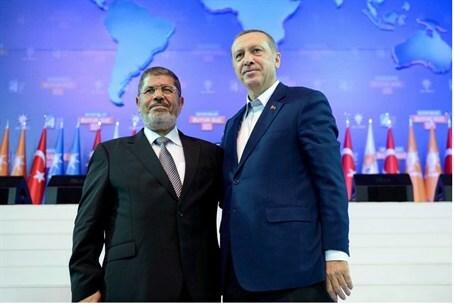 The report said that Morsi praised Turkey for standing by the Egyptian people during and after the revolution that toppled president Hosni Mubarak of Egypt in February 2011, and said Cairo would never hesitate to establish a partnership with Ankara. The Egyptian president, who addressed the AKP congress early in the day, lauded Erdogan's party as a "source of inspiration" for the region. He also called for support for the people of Syria and of ‘Palestine’.